This morning's Sunrise Serenade was "She's Funny That Way" by the Dorsey Brothers Orchestra. Enjoy the video from YouTube. This morning's Sunrise Serenade was "Mama Don't Want No Peas An' Rice An' Coconut Oil" by Count Basie and His Orchestra with Jimmy Rushing on vocals. Click on the song title to listen courtesy of Jazz On Line. Today's Sunrise Serenade was "I've Heard That Song Before" by Harry James and His Orchestra. Click on the song title to listen courtesy of Jazz On Line. The playlist for the July 26, 2017 broadcast of the Swing Shift Shuffle has now been added to the playlist filing cabinet. 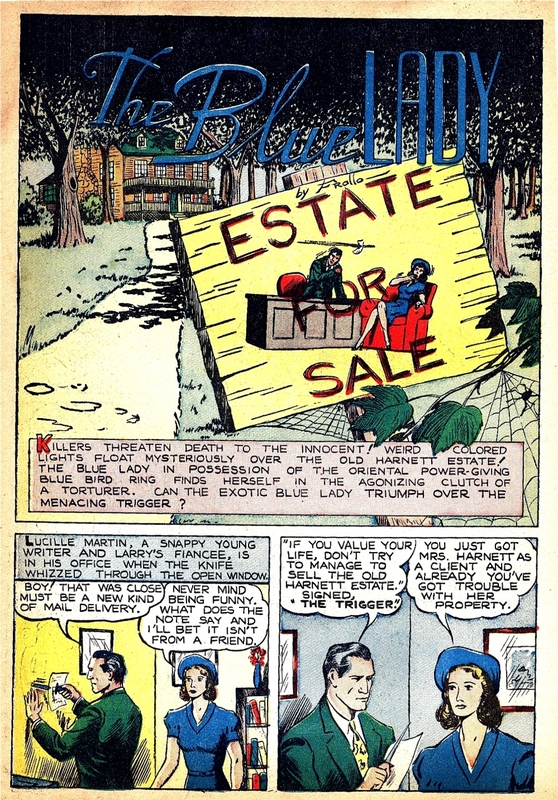 According to Four Color Shadows, the Blue Lady was one of the few female superheroes to precede Wonder Woman, and this story from 1941 was her final appearance. Apparently, she possessed an exotic ring that gave her super powers. The limits of her powers are not clear from this issue, but it seems she can turn into a mist, uproot trees and break chains, although gas does incapacitate her. This morning's Sunrise Serenade was "You Turned The Tables On Me" by Ella Fitzgerald and the Daydreamers. Click on the song title to listen courtesy of Jazz On Line. The Red Hot Lindy Hop lessons and sessions continue at the Rumba Room this Friday night. Free beginner lesson at 7:00 p.m. Free admission before 7:00 p.m. and $5 thereafter. Today's Sunrise Serenade was "Moonglow" by Benny Goodman. Enjoy the video below from YouTube. Sarah Sundin is an author who specializes in World War II-era romance. I'll freely admit that, when I even have time to read, "romance" is not on my list of genres. That being said, I do follow her blog, where she posts about events and other interesting facts from WWII. That is where I saw her post about Victory Mail or V-Mail, the U.S. military's solution to the logistical problem of millions of letters from military personnel to the folks back home. 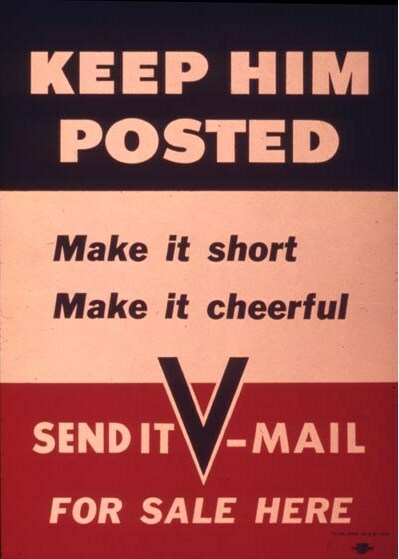 V-mail was written on pre-printed forms, and then photographed onto microfilm, which was transported to the recipient's overseas theater of operations. Once there, the V-Mail was reprinted from the microfilm back onto paper at one quarter the size, and then delivered to the recipient. Never mandatory, it was apparently successful, and the military saved room for around five million tons of cargo using this system. 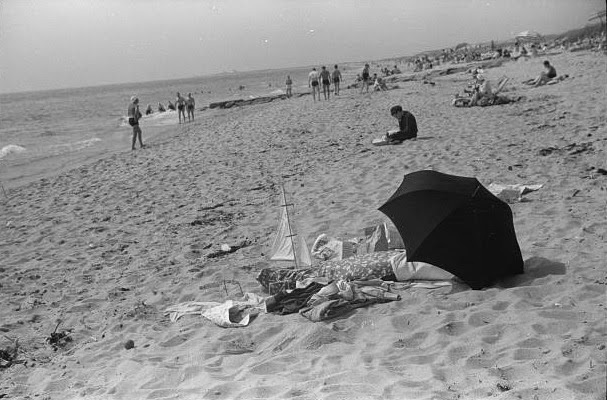 Like the person in this 1940 photo from the Library of Congress, I'm taking a break for the rest of the week, but I'll be back on Monday. This morning's Sunrise Serenade was "Somebody Stole My Gal" by Fats Waller and His Rhythm. Click on the song title to listen courtesy of Jazz On Line. This trip to the farm has a couple of good period jokes, including the horse's imitation of singer Eddie Cantor, and the owl's asking "Whose Yehoodi?" 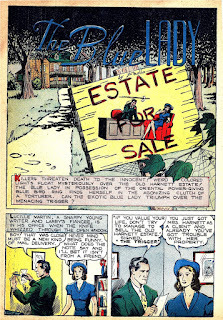 Posted on YouTube by CCCartoons, enjoy this 1941 Warner Bros. short, Farm Frolics. This morning's Sunrise Serenade was "Ac-cent-tchu-ate The Positive" by Johnny Mercer and the Pied Pipers. Click on the song title to listen courtesy of Jazz On Line. 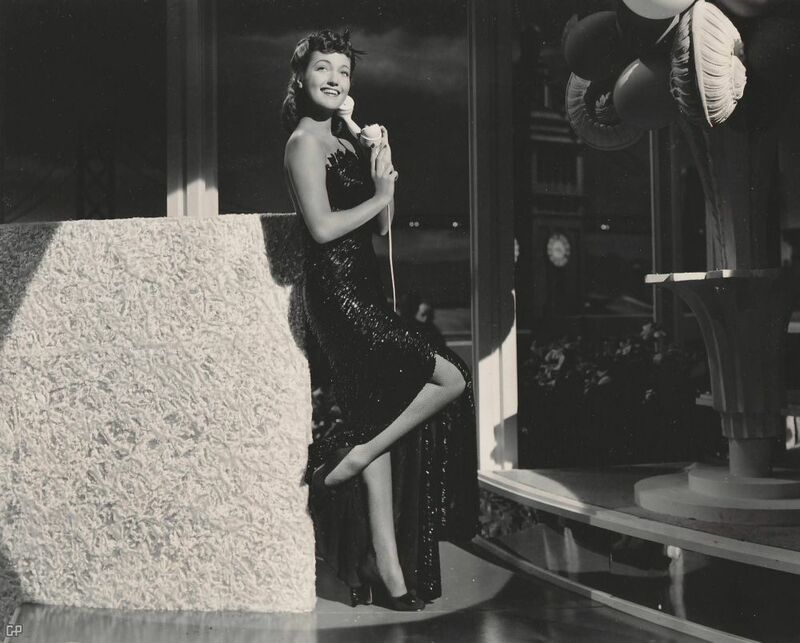 For some reason, I just felt like posting this photo of Dorothy Lamour, originally posted on Film Noir Photos. I'm not sure why, but it may be because she was the star always mentioned in the vintage cartoons as the irresistible beauty. Well known for her team ups with Bing and Bob in their Road to [pick somewhere] movies. Today's Sunrise Serenade was "In A Little Gypsy Tea Room" by Louis Prima and His Gang. Click on the song title to listen courtesy of Jazz On Line. The playlist for the July 12, 2017 broadcast of the Swing Shift Shuffle has now been added to the playlist filing cabinet. Vintage Everyday posted this color film footage from V-J Day, August 14, 1945, in Honolulu, Hawaii. While I like Jimmy Durante, I would not have minded if they had not put his song over the sounds of the film. This morning's Sunrise Serenade was "Easy As Pie" by Les Brown and His Orchestra. Click on the song title to listen courtesy of Jazz On Line. Sunrise Serenade: What's Your Story, Morning Glory? Today's Sunrise Serenade was "What's Your Story, Morning Glory?" by Glenn Miller and His Orchestra. Click on the song title to listen courtesy of Jazz On Line. This morning's Sunrise Serenade was "Ain't Nobody Here But Us Chickens" by Louis Jordan and His Tympany Five. Click on the song title to listen courtesy of Jazz On Line. Here is a fun little excursion to the local zoo from Warner Bros. in 1939. Posted on YouTube by CCCartoons, here is A Day At The Zoo. This morning's Sunrise Serenade was "Cow Cow Boogie" by Freddie Slack and His Orchestra with Ella Mae Morse on vocals. Click on the song title to listen courtesy of Jazz On Line. Unlike some other heroes who branched out into radio, serials and feature films, the Shadow did not start in comic books, but rather in pulp fiction, from which he later moved to the comics. Although these pulp stories had illustrations, it was the imagery in the prose that told the story. 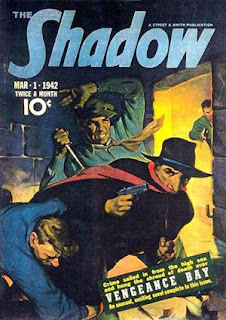 Comics, Old Time Radio & Other Cool Stuff posted this review of a March 1942 issue of The Shadow magazine. Today's Sunrise Serenade was "A String of Pearls" by Glenn Miller and His Orchestra. Click on the song title to listen courtesy of Jazz On Line. The playlist for the July 5, 2017 broadcast of the Swing Shift Shuffle has now been added to the playlist filing cabinet. This morning's Sunrise Serenade was "Little Joe From Chicago" by Andy Kirk and His Twelve Clouds of Joy. Click on the song title to listen courtesy of Jazz On Line. A July 4th Celebration on St. Helena Island, South Carolina, 1939. From the Library of Congress. The Hollywood Revue's preview of July programming on Turner Classic Movies is out. The Star of the Month is one of my favorites, Ronald Colman; and there will also be a spotlight on 50 Years of Hitchcock.